WordPress is a free blogging tool that lets you create beautiful blogs and professional websites. WordPress is also a powerful web marketing tool that combines an easy-to-use content management system with a fully-featured online publishing platform and lets anyone easily run their own websites without requiring the technical knowledge or web coding skills of a web developer or web designer to operate or manage. 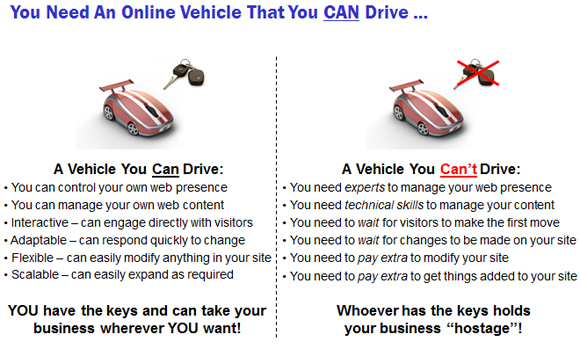 In other words … WordPress gives you an online vehicle that puts YOU in the driver’s seat! Now … you probably have some questions about what WordPress has to offer you as a content management system. Let’s take a closer look at what millions of people see in WordPress. What does WordPress offer you that will make it the right online vehicle for setting up your web presence? WordPress allows you to easily create a powerful website with almost unlimited scalability. This enables you to start simple and then expand and grow as your needs change, and to focus on more important things like running your business, adding content that will inform and educate your prospects and customers (and free up your time), increasing your exposure online, and improving your sales and marketing. 1. It’s Free! WordPress can be downloaded for free at WordPress.org. You will need a web hosting account for the self-hosted (free) version, but hosting a WordPress site is quite inexpensive. For example, a webhosting company like Hostgator will charge less than $10 a month, and you will be able to host any number of websites for that amount. If you really want to keep your costs way down (we’re talking so low, it’s free! ), you can get free hosting at WordPress.com. Keep in mind, however, that this option lacks the flexibility of your own hosting and will limit some of the things you can or want to do with your web presence. There are also costs involved if you want to upgrade later to use certain features or use your own domain name. We highly recommend, therefore, that you host your WordPress site using your own domain using the FREE, self-hosted version of WordPress, especially if you plan to run a business. You can get a professional WordPress site built and set up very quickly and then use our WordPress step-by-step tutorials to learn how to gain complete control of your own web presence. 2. Lots Of Great Training Available – When it comes to building websites, there can be a huge and lengthy learning curve for anyone who is not a “techie” or a “geek”. Many sites provide WordPress tips and tutorials online. One of the challenges with this, however, is that you can spend hours on end scouring the net for information. In addition to spending lots of time searching online for information, you will find many sites offering WordPress training, tips, or tutorials that have not invested enough time into planning an effective, well organized and logically structured training system for end users, and so their content is often delivered as a loose bunch of information that require more technically-apt users like developers to make sense of the information, or the training is out-of-date, presented out of context, delivered out of sequence, or just simply leaves out too many important steps, creating more confusion than clarity. Presenting training information this way generally only works for people who know what they’re looking for (e.g. those who are trying to solve a problem with their sites, or who want to get a specific thing done and need to know how to get through the next step). WordPress has many powerful features and applications that most users may not know about, however, and so many users are not aware of what they can achieve online with WordPress because no one goes looking for things that “they don’t know that they don’t know”. This is why we have developed WPCompendium.org. This site provides new WordPress users with a complete and methodical WordPress training system, including hundreds of detailed WordPress step-by-step tutorials. After your WordPress site is installed and configured (which our tutorials show you how to do), adding new content and new functionality to your site and keeping it maintained, optimized and secure is easy and takes very little time. You don’t need to learn how to write code or develop technical expertise to add, edit and manage content or manage a WordPress-powered blog or website. 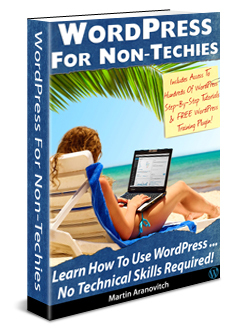 WordPress is a true blessing for all non-techies! 3. Super Easy Installation – Two things you need for a website are a domain name and webhosting. Good hosting companies will also offer applications in your control panel that allow you to install WordPress on your domain with just a few clicks. Gone is the complicated, technical coding of the past. Of course, if you are too busy to do it yourself, then get a professional web developer or web designer to help you. 4. Website Themes – A theme is basically a web design template which controls the look and feel of your site. WordPress offers you thousands of free themes to choose from. You can also purchase themes which can be installed on WordPress with just a few mouse clicks. 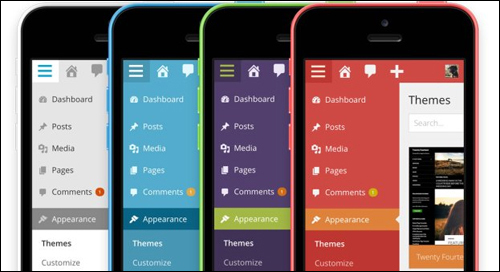 You can also have custom themes designed if you choose. The themes will provide a clean and professional looking site even without custom design work. And the great thing is, if you want to change your theme, you can replace your theme with another one, and it won’t affect your blog posts or pages. No need for expensive graphics and spending thousands of dollars on web design costs – with WordPress themes it’s all done for you. Our training tutorials will teach you everything you need to know about using WordPress themes, including where to find thousands of high quality free and premium themes. 5. Functionality – WordPress users benefit from the availability of thousands of WordPress plugins that offer you just about every type of functionality imaginable. These plugins are created by WordPress plugin developers and can be easily installed with just a few clicks. Plugins allow you to do almost anything you desire with ease, whether it’s communicating content or selling products. For example, you can track site visits, fight spam, create contact forms, improve your site security, and many more things. Best of all, many great plugins are available for free. We provide great tutorials on installing and using WordPress plugins that will extend your site’s functionality. If you need your WordPress site to do something that can’t be achieved with an existing plugin, then speak with a professional web developer. 7. Self updating – WordPress includes a feature that notifies you if upgrades are available for either the WordPress software or your plugins. Many times all you need to do is click for the upgrades to be installed automatically. Again, this means ease of use. 8. Search engine power – WordPress boosts your search engine optimization abilities. In fact, the top search engines (e.g. Google, Yahoo, Bing, etc.) love WordPress. There are many SEO-related plugins available that will increase the power of WordPress even more, and we provide tutorials on the best WordPress SEO plugins to use. If you’re a business, using a properly configured and SEO optimized-site can really help make you more competitive in the online space. 9. Technical support – although WordPress itself does not offer dedicated technical support to users (remember, WordPress is “free”), there are plenty of options available for getting all the WordPress help and support you need. You can speak with a professional WordPress web developer, web designer or consultant, or search online. WordPress.org has a very active forum with users who are willing to help people having problems with the software. Also, there are loads of websites, message boards, and blogs where people are happy to share useful information with you about WordPress. Because millions of people use WordPress and WordPress is not complicated to begin with, the expertise you need to build, run and manage a WordPress site successfully is quite readily available. The first place we recommend you look for help with WordPress, of course, is right here. Here are over 50 reasons to consider using WordPress for your business website or blog. 1 – WordPress is the world’s most popular Content Management System (CMS). It’s a proven platform, trusted and used by large companies, small businesses, and millions of websites. WordPress powers more than a quarter of all new websites in the world and has been continually refined and improved for over a decade (since 2003). Every new version of WordPress attracts over 30 million downloads. 3 – WordPress was designed for publishing content online. WordPress is not just a web application, it’s also a powerful online publishing platform and content management system. 4 – WordPress has features that automate the process of sharing content online and attracting readers and visitors to your site. Some of these features include the ability to instantly notify social media networks as soon as new content is published on your site, optimizing your site for best search engine results, and giving your visitors the ability to subscribe to your content via RSS feeds or email. To learn more automating your traffic generation with WordPress, see our WordPress Traffic Automation Blueprint tutorial series. 5 – WordPress is standards-compliant and provides you with a fast, light and free content management system that has sensible default settings, intuitive features, and an extremely customizable core. 6 – WordPress typically releases a new version with security updates, bug fixes, and improvements made to the previous version every 3-4 months. WordPress is a robust and fully-supported application that is continually evolving and being improved upon. Typically, WordPress releases a new version every 3-4 months (WordPress releases are normally named after legendary jazz musicians). 7 – WordPress is backed and supported by a diverse community of thousands of users, including expert web developers who continually work on improving and refining the platform. This means that bugs, issues, or security vulnerabilities get picked up quickly and addressed when the next version is released. 8 – WordPress handles your entire workflow, from initial draft to publishing. WordPress has built-in features that allow you to collaborate with other users who can review and edit your content, fix spelling and grammar errors, etc. without sending emails back and forth or using expensive software tools. 9 – WordPress has a drag-and-drop media file uploader that lets you effortlessly integrate rich media, images, videos, music, audio, and documents into your content, and a media browser that allows you to easily store, organize, and find your files. 10 – WordPress provides a “distraction-free” writing platform, allowing you to focus on your ideas and concentrate on creating your content without getting sidetracked by distracting features like texts, tweets, and status updates. 13 – WordPress lets you publish anywhere and everywhere with mobile applications for Android, iOS, and even by email. 14 – WordPress provides strong password protection for your site and content. You can protect individual posts or just parts of your content from public viewing, or even make your content completely private and accessible only to individual authors, members, or registered users with specially assigned roles or privileges. 15 – WordPress lets you split long content into multi-paged posts for easier reading. 16 – WordPress lets you save your content as a draft. This means you can save unfinished articles or posts that you are working on without publishing them (i.e. making them publicly visible), then come back and improve or rework your saved drafts later and only publish them when you’re happy to make your content public and visible online. 17 – WordPress lets you preview your posts “live” just as they will appear when published, without requiring you to publish your content first. This means you can get your content looking exactly the way you want it to look to your readers before making your content live. 18 – The WordPress content publishing platform is designed to make your site conform to your content, not the other way around. This is achieved using a powerful feature called a WordPress Theme – a full theme system which allows you to quickly and easily change the entire design of your site with a single click of the mouse without affecting the content. With WordPress Themes, you can literally change the look and feel of your entire site instantly and as often as you like. 19 – WordPress allows you to organize your content by day, month, year, author, tag, or category. WordPress also creates browsable archives dynamically to display your past content and provides a number of features to help keep everything looking up to date. Regardless of how much content you have on your site, you can keep it all organized and easy for your site visitors to find. 20 – WordPress has a powerful built-in search function that lets site visitors quickly find the relevant content they’re looking for. WordPress is also flexible when it comes to giving site owners search functionality. You can use the WordPress built-in search box, or choose to use an external search engine like Google Search instead. 22 – WordPress automatically typesets every letter you write, working seamlessly in the background while you work on your content to provide your posts and pages with seamless typography. WordPress intelligently converts web-unfriendly characters like quotes, apostrophes, ellipses, em and en dashes, multiplication symbols, and ampersands into typographically correct HTML entities. 23 – WordPress has been translated into more than 70 different languages. You can create a site that is localized for a specific international audience and delivered in a language of your choice. 24 – WordPress uses powerful “drag and drop” features to help you administer and fully customize just about every aspect of your site – from site menus to site layout and dynamic functionality on individual pages. 25 – WordPress lets you assign multiple users on your site and define different roles and privileges for each of your users. You can also configure your site to let users register themselves and either publish content on your site or require content to be submitted for review and approval by the site administrator or other users before publishing. 26 – WordPress provides extensive functionality by default and can be used right out-of-the-box. With WordPress, you don’t have to reinvent the wheel. With a little customization, however, you can truly unlock the power of WordPress and create a unique online vehicle adapted to your specific needs. 27 – WordPress source code is open and transparent. WordPress makes its code freely available. This means that anyone can take the code apart, use it to build new applications and improve any existing feature in the software. Add to this the fact that WordPress is built by a dedicated community of professional developers, academics, and enthusiasts, and you have a powerful online publishing platform with a rapid development cycle, frequent updates, software that is always up-to-date, no licensing fees or direct costs, and ongoing support from an international community of professional developers. 28 – Unlike many other publishing platforms, WordPress does not lock you into using proprietary data formats. WordPress believes that you should do what you want with your data, and relies on open standards that enable you to take your data with you. WordPress even makes available tools that allow you to seamlessly import data from other popular platforms like Movable Type, Textpattern, Greymatter, Blogger, b2, Nucleus, and pMachine. 29 – WordPress offers users a fully hosted option, as well as the option to run WordPress on your own domain. If you are planning to run a commercial website or blog, we recommend hosting WordPress on your own domain, as this gives you the most amount of freedom and flexibility. WordPress was designed to be installed on your own web server, in the cloud, or on a shared hosting account. You can even install WordPress on your personal computer, or on a corporate intranet. Wherever you choose to install it, you have complete control and are able to access and modify everything related to your site. If, however, you want the hosted version of WordPress, then check out WordPress.com. 30 – WordPress offers multisite technology. This technology allows you to control one or thousands of WordPress sites from one administration panel and is currently used to power over 20 million sites on WordPress.com and global sites like CNN and the New York Times, as well individual sites in networks, organizations, and universities. Multisite technology allows each individual user to have full administrative control over their own site without any security concerns. Each site can also have its own design (theme), individual functionality (using plugins), and manage its own users. Super administrators can implement network-wide policies and deploy security, plugin and theme updates at the click of a button from one central location. 31 – WordPress updates content displayed to visitors on your site fast. WordPress uses dynamic page generation technology to generate page requests by viewers on your site directly from your database and templates. This uses minimal server storage space and makes updating your site and your site’s design elements extremely fast. 33 – With WordPress, you don’t have to mess at all with design templates if you don’t want to. You can just browse thousands of ready-made premium quality WordPress themes from professional design companies that already have the look and feel you have envisioned for your website (most premium themes offer built-in features that allow you to further customize your theme) and purchase themes for just a few dollars (most premium themes cost anywhere between $10 – $100 or less). 35 – WordPress is highly flexible and adaptable. The WordPress core application allows developers to quickly and effectively modify and customize the application to suit their unique needs and integrate WordPress seamlessly with other third-party technologies. 36 – WordPress is “enterprise-ready.” WordPress has already been adapted to perform in various enterprise environments. It provides support for a number of enterprise-centric features such as Active Directory authentication, user management, workflow integration, scheduled backups, and more! 37 – WordPress allows you to connect with other systems. WordPress allows different systems in different environments to talk to one another. You can also use clients designed for other platforms. 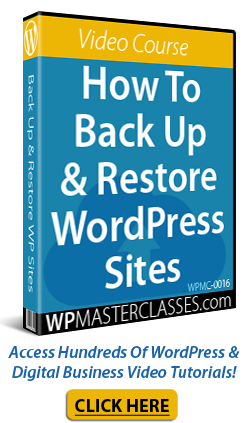 38 – WordPress makes installing, upgrading and maintaining the software simple and easy. WordPress automatically notifies you when there are new updates to the software, plugins, and themes. Updates can be performed manually with a click of the mouse or set to update automatically. 39 – WordPress lets you specify which HTML tags users are allowed to add when posting content on your site. WordPress also provides you with a built-in default list of safe HTML tags users can add in their comments and posts, so that the safety of your data or server is not compromised by malicious users. 40 – WordPress code is fully compliant with the standards of the W3C. The World Wide Web Consortium (W3C) is an international community that develops open standards to ensure the long-term growth of the Web. Being standards-compliant is important not only for interoperability with current internet browsers but it also ensures forward compatibility with future tools and technologies. 41 – WordPress is so much more than just a blogging tool. If WordPress is the most widely distributed content management system (CMS) technology in the world today and is used to power millions of commercially-driven websites, then chances are that many of the websites you are probably visiting right now are powered by WordPress. With WordPress, then, the distinction between a “blog” and a “website” is becoming increasingly blurred, especially since most of the time WordPress isn’t even used as a blog, but as a website. 42 – WordPress makes it easy for users to subscribe to your content using RSS feeds. RSS stands for Really Simple Syndication and WordPress fully supports protocols such as RSS 1.0 (RDF), RSS 2.0 and ATOM specifications. Almost every page on your site has an associated feed that your readers can subscribe to (e.g. latest posts, categories, comments, etc.). WordPress also allows you to add content such as podcasts and videos to your feeds. 44 – WordPress promotes interactivity and community-building on your site. You can interact with your site visitors through the use of built-in features like comments, trackbacks, and pingbacks. Visitors can leave comments on individual entries on your site, and you can then reply to their comments. You can also delete inappropriate comments, and enable or disable comments on a per-post basis. In fact, you can easily create an entire social networking site with WordPress. 45 – WordPress helps you manage and eliminate comment spam on your site. WordPress comes with default tools to help you fight spam. You can control spam using plugins and by moderating your “comments” settings. For example, you can moderate all comments before they appear on your site, block comments with specific words in them, block comments posted from specific IP addresses, and block comments containing more than a number of specified links. 46 – WordPress can send out automatic notifications. WordPress notifies you via email each time there is a new comment or a comment awaiting moderation. 47 – WordPress uses shortcodes. Shortcodes are simple commands (e.g. [shortcode]) you can insert into your posts and pages that allow you to add scripts and functionality to your site without the need to touch code. 48 – WordPress has a built-in configurable user registration system that lets people register on your site, manage their profiles, and post comments. You decide whether registered users can leave authenticated comments on your site, close comments to non-registered users, etc.. Additionally, there are plugins you can add to your site that will only display content to specific types of users (e.g. members in certain levels). 50 – WordPress provides users with access to more than 40,000 free open-source plugins and thousands of free themes. The WordPress plugin and theme library is constantly growing. With plugins and themes, you can add every kind of functionality you can imagine to your website and make your site design look as unique as you want it to be. 51 – WordPress is 100% free to download and use. You can install WordPress on unlimited domains and use, extend, or modify WordPress however you choose. You can also use it commercially without licensing fees, restrictions or having to display third-party advertising. WordPress is “free” not just in terms of price, but also in terms of the amount of control you have over using it. You have complete freedom to run the program for any purpose, the freedom to study how the program works and to change it to make it do whatever you wish, the freedom to redistribute the application, and the freedom to distribute copies of your modified versions to others. 52 – WordPress is mobile responsive and works on every kind of device. However you choose to consume information, WordPress lets you work with every kind of device – Smartphone, tablet, notebook, desktop, etc. 53 – Admin color schemes to suit your personality. WordPress lets users choose color schemes for their administration area, so they can work in a colorful environment that suits their personal taste. With literally thousands of free plugins available to extend what WordPress does and free themes that completely change the way WordPress looks, all you basically need is the WordPress application, a domain name, and web hosting. Most of the power of WordPress is available to you for little to almost no cost. Doesn’t it make sense, therefore, to consider using WordPress to power your web site, or switch your existing web site to WordPress and start growing your web presence using an online vehicle that is more powerful, more flexible, more scalable, less restrictive, cheaper to run, easier to use and fundamentally “smarter” than any other online publishing platform or content management system available?